A few days after Texas A&M was given the No. 4 spot in the year’s first College Football Playoff rankings—ahead of Washington, who is undefeated, and Louisville and Ohio State, who each matched A&M’s 7-1 record—they made sure they lost it, falling to unranked Mississippi State. The Bulldogs jumped out to a 14-0 lead in the first quarter, and they never relinquished it. A&M’s Christian Kirk returned a punt 93 yards for a touchdown just before halftime to cut into the lead, but it still left the Aggies down 28-14 as they headed to the locker room. 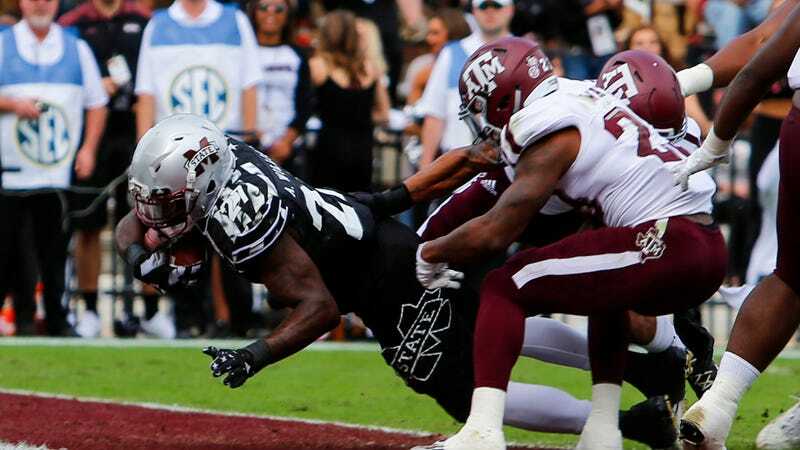 In all, the Aggies were sloppy on third down (converting four of 15) and couldn’t do anything to stop the Bulldogs’ running game (giving up 365 yards to a team who hadn’t cracked 300 in rushing this season). A&M quarterback Trevor Knight sat out the entire second half with a shoulder injury, but backup Jake Hubenak brought the Aggies toward a comeback in his stead. But two fourth-quarter touchdown passes weren’t enough—one a 54-yard catch from Kirk—and an interception on Hubenak’s final drive sealed the deal for Mississippi State.